The Bulldogs drew a power play early in the first, and spent nearly a full two minutes in the attacking zone with a bushel of chances around the net, but Jordan Naylor kept it scoreless with a couple good stops. The Clippers countered out of the box on a 3 on 1 rush, but John Hawthorne came up with a big save in the slot on Marcus Mitchell. The Bulldogs would open the scoring a minute later, as Ryan Novecosky and Stephen Castagna chipped the puck up the left wing for Tanner Pochipinksi, who fought it out at the line and raced up the left wing on a 2 on 1 rush where he kept the puck and beat Naylor with a quick release short-side to make it 1-0 Bulldogs at 4:42 of the first. The Bulldogs ended up in the penalty box a minute later, but killed it off with Hawthorne looking sharp with a couple of big saves in tight. The Bulldogs were instantly penalized again, but again killed it off, with a great chance for Stephen Castagna on a short-handed breakaway that saw Naylor come up with a big right toe save to keep it a 1-0 game. The Bulldogs were again penalized two minutes later, with an extra two minutes added on for arguing the call resulting in a four minute Nanaimo power play. The Bulldogs killed off the first two minutes with not giving up much, but the second penalty came back to haunt them as Aiden Hansen-Bukata set up Carter Stephenson at the top of the point where he scored on a partially mis-fired one-timer that found the top corner over a screened Hawthorne - with Marcus Mitchell possibly deflecting it. Tyler Williams also drew an assist at 14:36 of the first, for a 1-1 tie after 20 minutes, with the Bulldogs up 15-11 in shots on goal. The second period began with lots of whistles, not much in the way of flow, and both sides fighting the puck through the opening four or five minutes. The Bulldogs earned a power play on an errant stick soon afterwards, and made good on the power play with a minute of pressure before Jackson Doucet fed it back to the left point for Aaron Bohlinger. He would one-time it on goal where Keaton Mastrodonato deflected low inside the post past Naylor's blocker at 5:39 of the second. The Bulldogs were penalized two minutes later, before being whistled again on a battle at the side of the net putting the Clippers to a 5 on 3 power play for 35 seconds. John Hawthorne came up with three big saves, twice on one-time set ups for Gunnar Wegleitner, and once on Ethan Scardina on a rebound in the paint. Other than that, the Bulldogs did a solid job in keeping the Clippers to the outside to kill it off and protect their lead. The Bulldogs continued to push the pace and create chances, but couldn't add to their lead. They earned a power play later in the period, but the Clippers had the best chance in it early when Kyler Kovich skated in alone on a shorthanded breakaway. Hawthorne would out-wait him to keep it out and keep it 2-1. The Bulldogs came close seconds later to finding the net, on a dump in that hit a partition and went on goal, but Naylor reacted with his right toe to keep it out. Shots in the period were 14-5 Bulldogs, for a 29-16 advantage after 40 minutes. The third period started somewhat similar to the second, with lots of whistles early and not much in the way of flow or chances. The Clippers would get the equalizer on an end-to-end rush just under five minutes into the period, as Sammy Steele drove wide down the left side and in alone on Hawthorne who made the save, but couldn't locate the rebound before Ethan Scardina jammed it home in the paint to make it 2-2 at 4:50 of the third. The Clippers spent the next few minutes all over the Bulldogs zone, with Hawthorne making two big saves on Marcus Mitchell and Tyler Williams in tight to keep it tied. The Bulldogs weren't able to respond, as the Clippers continued to carry the better of the play, eventually going up 3-2 on a dump-in that the Bulldogs retrieved but then turned over to the middle of their zone where Jonathan Stein picked it off and walked in alone on Hawthorne were he put a backhand home cutting to the net. The goal was unassisted at 12:15 of the third. The Bulldogs weren't able to generate much in the way of chances or a sustained attack the rest of the way, but did have a couple of near misses around the net in the final minute with their goalie out for the extra attacker. 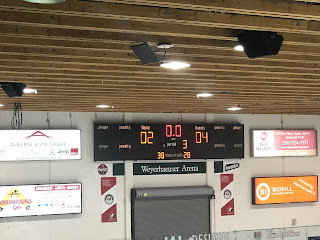 The Clippers would hold on, before rubbing some salt in the wound with an empty netter potted by Thomas Samuelsen, with assists to Ethan Scardina and Tyler Williams at 19:57 of the third to complete the scoring for the 4-2 final. Third period shots were 12-9 Clippers, with Jonathan Naylor earning 1st star honours with the win, while John Hawthorne took the loss. The Bulldogs went 1 for 3 on the power play, while the Clippers went 1 for 6. The Bulldogs are next in action Wednesday when they host Kazakhstan.